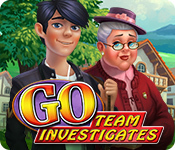 GO Team Investigates: Solitaire and Mahjong Mysteries is rated 4.2 out of 5 by 13. Rated 5 out of 5 by joker300 from relaxing!!!! good game, but when you buy a undo card, you should be able to keep it, for at least five hands, the cards are pricey. Rated 5 out of 5 by mary5176 from Great variation of 2 games in one Love the idea of solitaire and majjang and alternating games. No way can you get bored with this one, and the graphics are really nice. Rated 5 out of 5 by beckins from Mahjongg and solitaire and donuts oh my! This is a delightful little game with two of my favorite card and board games and a logic problem just like in those puzzle magazines you can buy just about everywhere. I did have to replay a couple (or more) of the boards before I could finish the hand so not too easy (I like a challenge). I have only 15 mins left in the trial and I just solved the first case so this game may take a while to finish. Well worth giving it a try anyway. I am off to buy and continue my investigating with the help of G and O!! Happy crime solving everyone!! Rated 5 out of 5 by Mooseles from THREE games in one! I enjoy both mahjong and solitaire so I thought I'd give this game a try. I've played almost through the end of the trial period, finished one case, and I've already decided I WILL buy this game. It isn't fancy; I think there are just two mahjong tile sets and one type of solitaire game with two choices of deck, but that's fine with me. The deciding factor for me (and a really pleasant surprise) was that there's a THIRD game in here - a logic problem at the end of each case for you to determine who the guilty party is. They show you the clues you've earned from the mahjong and solitaire games AND the appropriate logic problem grid to give you a good start. I didn't find the mahjong or solitaire games to be difficult but I didn't win the first time every time so there was enough challenge for me. I do find logic problems to be always thought-provoking. I did solve it correctly but it took a fair amount of thought. The description says there are eight cases to solve and it took me almost an hour to solve the first one so there is reasonable depth here. This game delivers MORE than it advertises...a VERY nice (and rare) thing! Rated 5 out of 5 by Buttercups from Fun Majong and So;litaire game I highly recommend this game. If you liked Double Clue and Wedding gone wrong. You will like this game also. I tried it all the way through the trial and then I bought it. I really like these type of games. I recommend it for the whole family. My son and I play it together and he has a learning disability. It kept his attention. He also read the clues. Rated 5 out of 5 by 2020moonlanding from There's Never Enough Donuts This is a lovely and rather unique game. 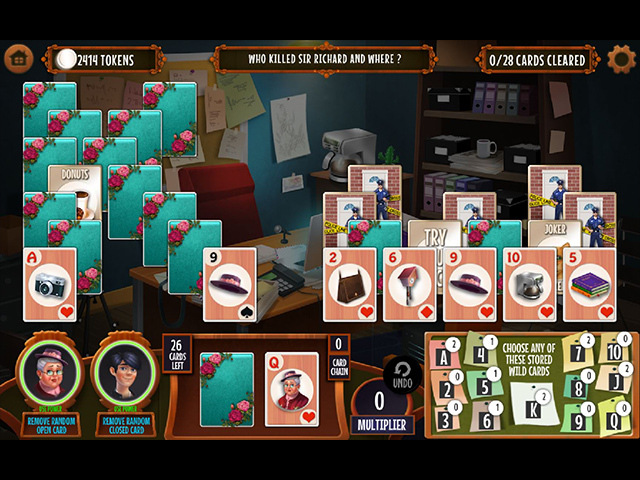 It offers a mix of solitaire and mahjong gameplay with the option of playing only solitaire or mahjong, or by playing the default of a mix. 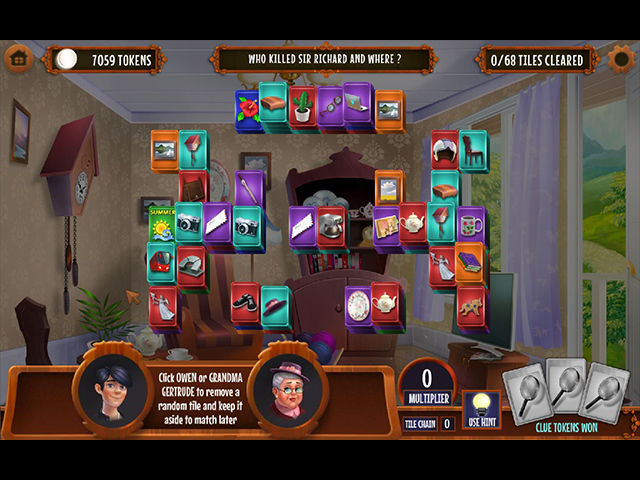 As you play you receive clues to solve a mystery case where Grandma Gertrude and her grandson need your help. After all of the clues are found you mark a grid to figure out who is the criminal. There are charming extras like finding a yummy donut to unlock the police cards and chance cards to add tokens or take away one of your power-ups. I found the gameplay to be flawless and the music to be a perfect fit for this light hearted mystery game. This is a nice game to relax to. Rated 4 out of 5 by bunnyeyes from Almost a 4 Good: could choose to only play solitaire; majong's okay but harder on my eyes. 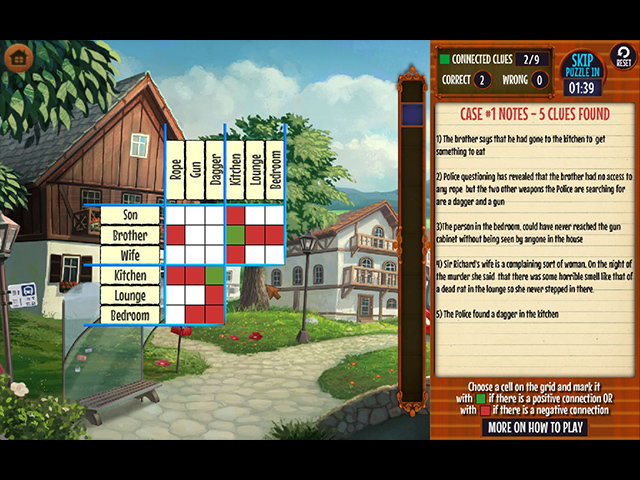 Good: enjoyed the final clue grid; much easier than others I've play. Not so good- annoying sound with every card pick. Not so good - couldn't figure out how to scroll down to see and move between all the clues. Otherwise cute game! Rated 4 out of 5 by MOUSE8 from VERY UNHAPPY i love the game but was unable to turn off the annoying music. any options on how to lose the music? Rated 4 out of 5 by saratt from Cute and Different This was a nice change of pace. I only played the demo so my review is based on that. It is a mahjong and solitaire mix but if you prefer one over the other you can choose to only play your preferred way which I thought was a plus. For the mahjong: Pros: It was usual type of mahjong. It had hints and you could remove two random tiles. Cons: You couldn't shuffle the board. I felt it was a little too easy. It might get tougher as you go. I was only able to solve two cases which was about 12 games. For the solitaire: This is a up/down solitaire Pros: There are joker cards that you start with and they give you quite a few as well as you get one every level. You can also purchase them but it is quite expensive $5000 per. I found I did accumulate money pretty quickly so I am not sure whether this will balance out the price of the joker as you go. There are also two ways you can eliminate two random cards per game. When you get a card chain you get more cards instead of points which is very useful Cons: The graphics are a little slow in turning over cards so you might get impatient and miss cards. You can't re-do the level to clear all the cards. You get one shot so you have to use the joker cards. It is difficult to get card chains. This might change as you continue. After you collect the clues for the mystery you go into solving the case. I felt this was a clever way to solve. You are given a grid to cross off suspects or places or weapons according to your clues. Basically you eliminate according to the clues. This requires a little thinking and takes a little getting used to the system but it was a nice challenge compared to the games simplicity. Overall I thought this was a cute and different game that is nice for a change of pace of the usual HO and solitaire games.